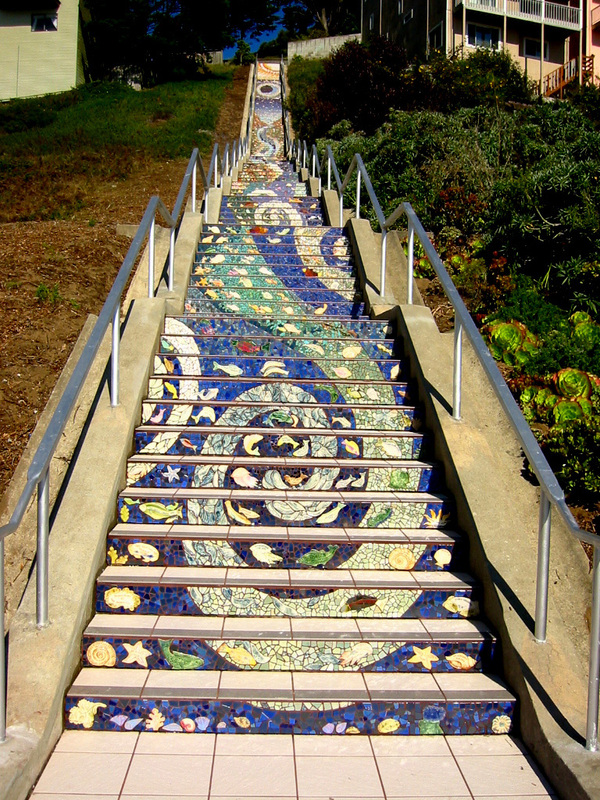 The 16th Avenue Tiled Steps project has been a neighborhood effort to create a beautiful mosaic running up the risers of the 163 steps located at 16th and Moraga in San Francisco. Artists Aileen Barr and Colette Crutcher led the creation of the 163 mosaic panels that were applied to the step risers, over 300 neighbors joined us in making them, and over 220 neighbors sponsored handmade animal, bird and fish name tiles imbedded within the mosaic. The City permitting process was completed on August 18, 2004. KZ Tile, a major San Francisco tilesetting company, generously agreed to set the mosaic panels into the risers and tile the step treads with rough, nonslip tile. We completed the installation of the Project in August 2005, with the exception of the caulking, which wasA done in early September 2005.